With my house finally sold and highly disappointed at not making the ride to Newfoundland this summer with Miss Rider, Madeline, and GoGo Gear's, Arlene, I finally had some time to ride! With the thought of spending the winter months in the much warmer climates of sunny Florida, making the acquaintance of the sister chapters of Women in the Wind located in the state made sense. Deciding on a route was like playing "connect the dots". My old neighbour from Kerhonkson now lives in the Keys, and I've never been there ... add another dot! Time frames began to shape up with an invitation from Becky Brown, founder of Women in the Wind, to join her for dinner in Fort Lauderdale. A Sunday outing with a couple friends yielded a job offer, providing a "return by" date, with essentially ten days between. Casually chatting with my daughter, Skye, I asked if she would be interested in joining me. "Sure! I've always wanted to go to the Keys. When do I have to be there?" Her departure from Louisiana was delayed by the major storm and flash flooding that hit just before Halloween. So much for a day to rest after her 800 mile trek to meet me at my parents' in Wildwood! Her '86 Honda Rebel 450 had been using a quart of oil with every tank of gas coming over, and we had our doubts about it completing the trip. There was oil apparent in the exhaust and no obvious leaks, so Skye decided if an engine rebuild was in order any way, she was going to take it as far as it would go! I filled Rosie with gas and she filled the Rebel with oil and we were on our way. Our first pit stop in Mims was encouraging, the Rebel's oil level was holding steady. All the fussing over her that morning had put us behind our anticipated time frames and we missed our hook up with the WITW Livin' in the Wind Chapter in Palm Bay. It was dark by time we got that far south and agreed to meet up at another time. 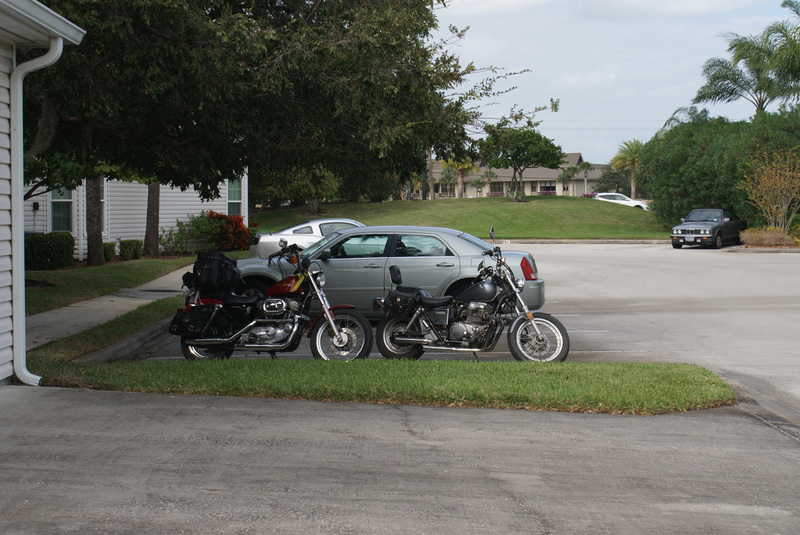 We found our way to my Aunt's house in Vero Beach, where Skye finally had a day to rest up and take a break. My Aunt shared her picture books and tales of her travels, pointing out places of significance in our family history. This in turn led to more family stories, going well beyond the three generations sitting around the table!